There’s been a resurgence in the craft of making good coffee – by hand. 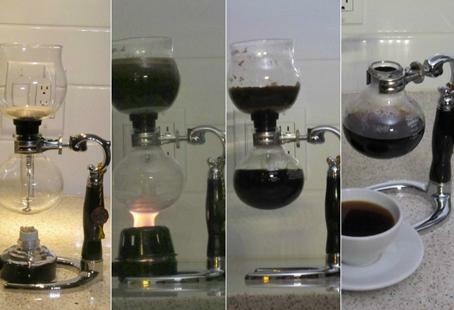 Thank the hipster, third-wave coffee shops, which look to old-school techniques like the pour-over and the vacuum syphon. First-wave coffee was more utilitarian than epicurean, brought coffee into homes via massive tins and produced a weak, flat but serviceable brew. Second-wavers brought us nomenclature like “double-double” and “triple venti half-caff no-foam latte”. Third wave coffee shops – like Caffe Artigianoand Elysian Coffee – are for the connoisseurs; they focus on bean origin, delicate roasting and nuanced brewing techniques. What’s even better is that manual brewers, which are simpler and less expensive, are proving to be superior to their electric, push-button, automated counterparts. The third-wavers have brought back the basics and people are running with it, to exacting standards: water should be at 195-205°F (if you don’t have a thermometer, boil water then wait 30 seconds off heat), coffee should be stirred once or twice at timed intervals, filters should be good quality and should be rinsed, water should be poured concentrically in V-drips, etc. The truly serious home-baristas will even weigh out their coffee and water and use a timer to know when to stir, how long to brew, and exactly when to pour. These sound like rules, but perfection is subjective. You can change the flavour profile of a coffee bean just by changing the temperature of the water, the type of grind, how long you brew, how long you allow the grounds to “bloom”, etc. Make the process fun, even entertaining, and keep experimenting until you brew something you love. People now talk about coffee the way they talk about good wine; coffee can be fruity, acidic, earthy, robust, caramelly and bright. With 700-1,500 aroma compounds (compared to wine’s 300-600) it’s justifiable to start talking about coffee’s flavour profiles with a bit more respect (and a lot more adjectives). Plus there’s also soil, shade and altitude to consider, in addition to country of origin. Todd Pollock, VP with Caffè Artigiano, stresses that you need to buy your beans as close to the roasting date as possible. Generally, give them a two-week window before considering them stale. 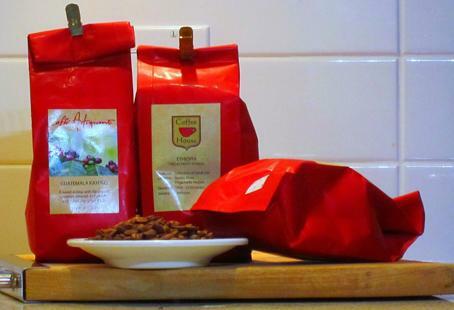 A package of quality beans or beans from a reputable source will always indicate a roasting date, usually with a sticker on the bottom of the bag. And Pollock says if you buy your beans pre-packaged, make sure the bag features a one-way valve. This valve allows for CO2 to escape (a by-product of fresh roasting) while preventing oxygen from entering (and degrading the volatiles in the delicate beans). It’s not enough to know which country your beans are from – if you really want to pursue that perfect cup of coffee, make sure your beans are from a reputable source that has a good relationship with the farm and farmers. When it comes right down to what kind of beans to buy, Pollock encourages consumers to pull away from the idea of “light, medium and dark” roasts as flavour descriptors. Instead, he’d rather educate people about the elements that influence a coffee’s flavour profile. At Caffè Artigiano, for example, they’ll ask you what kind of flavours you like (caramel, chocolate, citrus, etc.) what kind of body you prefer (bold, earthy, bright, etc.) and go from there. In general, beans grown in a lower altitude are earthier, and higher altitude are sharper; beans from Africa are bright (even sparkling), floral and more acidic; beans from South and Central America are spicy, fruity and chocolatey; Asian beans produce coffee that’s rich, syrupy and bold. This kind of information is shown on the front and back of every bag of Caffè Artigiano coffee. When you get them home, Pollock suggests you think of them as you would potatoes: store them in a cool, dark place. He keeps his beans in an opaque, airtight container in the lowest cabinet in his kitchen. And never put them in the fridge or freezer, which can draw out and destroy the delicate oils. If you’re having beans ground in-store and you don’t know precisely what kind of grind you need, Pollock recommends simply telling the barista what kind of coffee maker you have and letting their expertise guide the grind. If you’re grinding at home, always use a burr grinder. Not sure what that is? Read on. The heat produced in a blade grinder destroys the delicate and volatile oils in the beans. Both these issues result in muddy, flat and inconsistent coffee. Instead of blades, burr grinders operate like a mortar and pestle, grinding the beans instead of cutting them. This produces uniform grinds without destroying any of the oils. They range widely in price, but any one will always be better than the most expensive blade grinder. Hariodoes a brilliant job with manual coffee grinders, and if you’re committing yourself to the coffee-making experience, there’s something deliciously satisfying about crunching down on those beans and feeling the crackling under your hands. It’s obviously compact and simple in design, but very efficient. Hario makes one even slimmer than the one shown above, and several more that are larger and charmingly designed to look like they came out of an apothecary. It’s tiny, simple in design and easy to use/clean. It will grind everything from coarse French Press style to near-powder for Greek brikis. Fewer moving parts means there’s less chance of something malfunctioning (and if it does, it’ll be an easy fix). If you should ever break the glass canister, the top grinder actually screws perfectly onto a standard mason jar. It obviously takes longer than an electric grinder – a few minutes to grind enough for one cup of coffee and finer grinds will take even longer. You’ll need to dismantle and reassemble the hand crank every time you adjust the size of grind (burr distance is adjusted with a simple screw mechanism under the handle). So it can get cumbersome if you’re switching brewing methods, but once you find the perfect setting for a specific brewing technique, you’re good to go. Perfect for those in a small apartment who have little counter/cupboard space to spare. It’s an ideal grinder for keeping at your secondary home, whether that’s the office, weekend cabin or boat. Also great for those who simply don’t grind coffee very often. No need to invest a lot in something you use infrequently, while still retaining the quality of the end product. For a powerhouse of a grinder, this Baratza has a surprisingly small footprint. It grinds beautifully and quickly – it’s just a breeze to use. Baratzas in general make solid performers but the Preciso is particularly elegant and, well, precise. These are called “V-drips” because the cone is shaped like a “V” allowing the hot water to funnel down through the grinds, producing a coffee that drips directly into a mug. A more modern label for them is “pour-over” because you pour hot water over the grinds. You can get glass and ceramic versionsof this V-drip design, but the really exciting advancement in this area comesfrom the Clever Coffee Dripper. It looks very similar to the Melitta in design, except that it has a built-in stopper, allowing you to immerse the coffee grounds for as long as you prefer before releasing it into a cup. The Clever design holds the coffee in the cone until it is placed on top of a mug, which pushes up on the stopper, releasing the coffee. It really is very clever. Essentially, this combines the best of filter cone drippers and the French Press. Extremely simple to use and very fast. Very light, so perfect for packing if you’re traveling. An inexpensive coffee brewer that’s also quite pretty. It’s portable (especially since the newer models now come with a lid) so you can prepare your coffee, then bring it over to your desk (or bedside) and wait until it’s ready. Clean up is a cinch: just lift out the filter and toss. You do need to be a bit more careful when pouring the water - too fast and you’ll create channels or pockets, resulting in grounds that may not become saturated. While you can get away without stirring with other coffee makers, you really can’t with this one. Stir using a delicate touch. 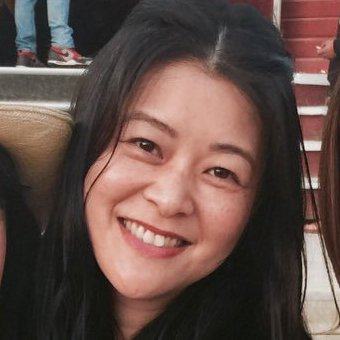 Lovers of this method appreciate the old-school charm and bottom-line effectiveness. 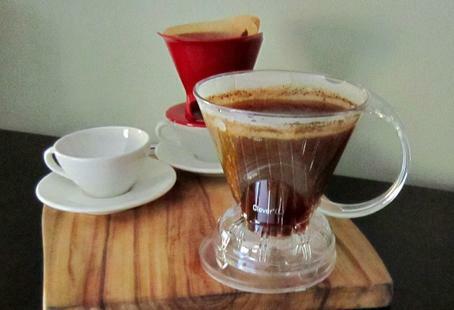 Many understand that as long as you invest in good beans and a great grinder, a simple brewer is all you need. Morning crankypants/sleepyheads will really appreciate both the simplicity in execution and near instantaneous reward. You can order this online at Sweet Maria’s, a fantastic online resource for nearly all things coffee related. The Aeropressis an ingenious little device that combines the best of French Press and espresso brewing, allowing you to make one or two perfect cups of coffee at a time. There are basically two tubes: the first one holds the filter, coffee grinds and water; when the second one is inserted, its rubber tip creates an air-tight vacuum and as you push down, the trapped air forces the water to express through the grinds. You’re left with very clean, sediment-free concentrated coffee. Then you just add water to taste, much as you would to make an Americano. The JavaJugis the very new addition to the Aeropress family. It was designed so that you can make and hold up to four cups of coffee – a nice feature that makes the Aeropress a lot more versatile. It also acts as a carrying case, since the entire Aeropress assembly slips right in, making it even easier to travel with. One of the best features of the Aeropress is the clean-up, which is virtually hands-free and mess-free. After you’re done pressing out your coffee, unscrew the bottom (which holds the filter in place), then continue pressing and a tidy, compact puck of grounds will simply pop out. If you’re making another cup of coffee immediately, you can even reuse the paper filter (you can actually use it up to five times), although a re-useable metal filter is also available. It’s fast, with a brewing time of 20 seconds. With such a short brewing there’s no bitterness that can come with over-extraction. 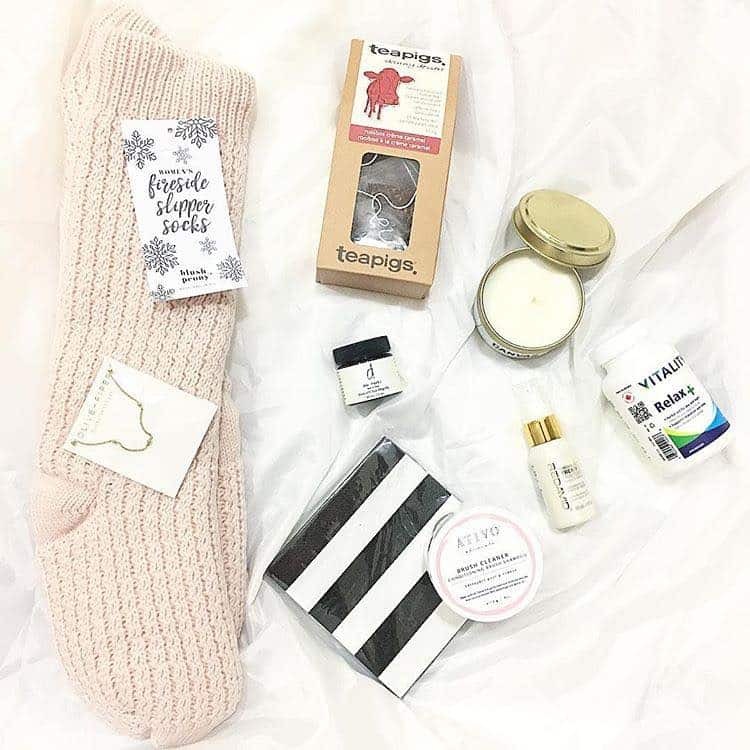 It’s small and portable, perfect for the office or travelling. It’s extremely easy to clean up. You can buy replacement parts for almost any component. The JavaJug is extremely durable and can even double as a kettle if need be. It feels a little finicky at first, but after the third attempt you’ll easily get the hang of it. It’s always going to drip a little after you add the water so you have to have it set up over a mug or thermos from the get-go. This is perfect for someone who needs their coffee quickly, but still wants it to taste incredible. It’s especially ideal for a single serving. This is the ultimate solution for anyone who ever hesitated to make a single cup of coffee because it was too complicated or messy. Anyone who travels a lot but loves their coffee will probably never let this leave their side. Available online at Aeropress. The JavaJug will be available later in September. For anyone who thought the French Press hadn’t changed much in decades, you’ll be blown away by the advancements in the very smart, very efficient the Espro Press. Created by Vancouverites Bruce Constantine and Chris McLean, the Espro Press has reinvented the French Press, making a vessel that produces a sludge-free coffee while keeping it simple to use. 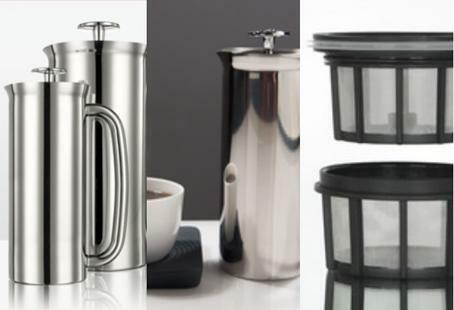 The Espro Press recently de-throned Bodum as the French Press-of-choice by mega home retailer Williams Sonoma. Even without the WS seal of approval, this is bound to become the new standard for press-style coffee makers. This press pot comes with two fine-mesh filters. The lower primary filter is nine times finer than standard French Press filters; the inner secondary filter is 12 times finer. Together they create a filtration that is just as easy to use as a traditional French Press, but produces a very clean, flavourful and sediment-free cup of coffee. Plus, the filters prevent the brewed coffee from interacting with the grounds below so your coffee will never sit in the grounds and become over-extracted. You’re guaranteed that your last cup will taste as good as your first cup. Plus, the vessel features a vacuum wall with double insulation, meaning your coffee will stay piping hot for an hour or two. 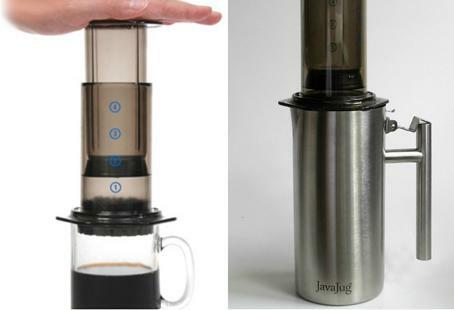 Now you can actually make your coffee in advance and serve as needed through a meal. Co-founders Constantine and MacLean began with a small one-cup model (8 oz), then successfully used Kickstarter recently to fund the production of a larger model (30 oz). Then, due to customer demand, used Kickstarter again earlier this year to create their latest medium-sized vessel (18 oz), which brews enough for two large mugs. This is probably the best method of ensuring consistency when it comes to making your coffee. The French Press is Pollock’s (Caffè Artigiano) preferred method of brewing coffee simply for this reason. The metal filters don’t absorb the aromatic oils, allowing you to enjoy them in your cup. Allows you to make coffee an advance, never having to worry about it getting cold or over-extracting (and getting bitter). It’s really beautiful with a contemporary mirror-like finish. 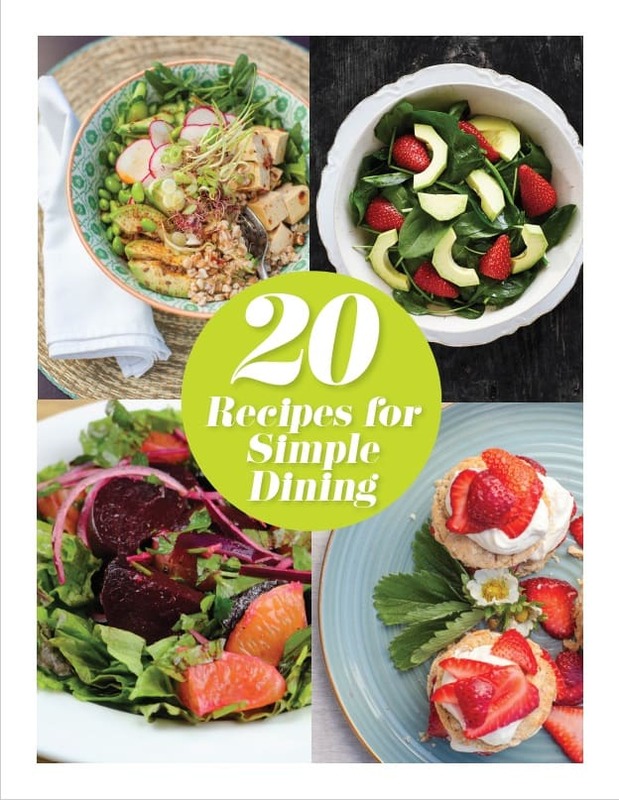 It’ll look fantastic on the table or countertop. Metal construction means no more breaking glass carafes. Replacement filters are available – they’re also made in Canada! There’s no way of closing off the top entirely, meaning heat does escape from the spout. French Press users are going to be overjoyed. It only improves upon the original design, maintaining everything that’s inherently great about the technique while practically eliminating all its known flaws. Because it comes in various sizes, even individuals who want just one perfect cup of coffee can have that now. Available at Espressotecand, of course, now also at Williams Sonoma. 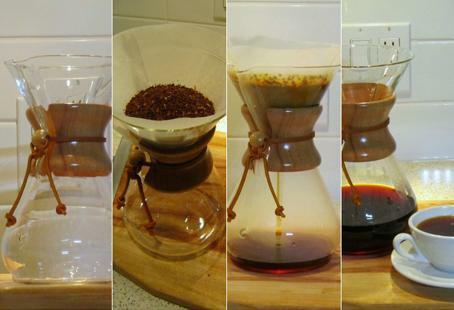 There’s a devoted following to the old school, yet gorgeous, Chemex coffee brewer. It was invented by a German Ph.D. chemist in 1941 who was looking for an easier and more efficient way to brew immersion-style coffee. This resulting vessel is so simple yet so elegant it’s actually on permanent display at MOMA NY, in the Smithsonian and many other art institutes around the world. The Chemex was literally born out of a lab: its first incarnation was a mashup of a laboratory glass funnel and an Erlenmeyer flask. A couple of years later and the Chemex was ready for the public. It’s made of heat-resistant borosilicate glass in an hourglass shape with a polished wood collar and leather tie at the neck. Beyond its beauty and elegance, it simply brews a clean and delicious cup of coffee. It’s a pour-over method but the special Chemex filters are 20-30% heavier, so they remove far more sediment than traditional filters. Remember this was conceived by a Ph.D. scientist, so everything was engineered to allow for the optimal immersion time of the coffee grounds in the hot water before being filtered. It’s one piece, so there’s no need to worry about parts breaking down or not working. It truly is gorgeous. Skip the cupboard – you’ll want to find a place for showing this off. The heavy duty filters produce a clean cup of coffee. It’s extremely easy to use: place filter in top, add enough hot water to allow for “blooming”, add more hot water and wait 6-7 minutes. There’s an option for keeping your coffee warm on the stovetop, but you’ll need to purchase the Chemex wire grid as the vessel shouldn’t directly touch the heating element. You’ll need to be careful – it is glass, after all, and prone to breaking. Without keeping it warm on the stove, the coffee gets cold quickly. You’ll have to buy Chemex brand filters for this – generic won’t work. 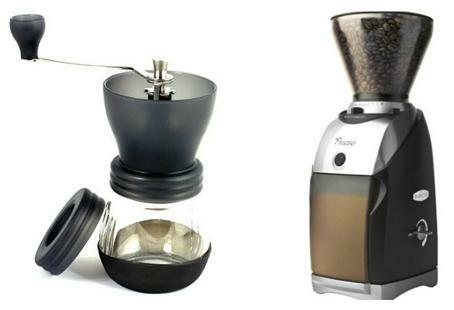 Anyone with a sense of design is going to love this coffee brewer. It’s a timeless classic. People who appreciate the immersion brewing method will really enjoy being able to manipulate variables like water, grinds, etc. This is great for the host or hostess who likes to have every piece count. In this case, it’s the ultimate marriage between form and function. Available at Elysian Coffee, 1778 West 5th Avenue and The Old Faithful Shop, 320 West Cordova Street. Vacuum pots (vacpots) or syphon brewers will have you feeling like you’re back in Chem 11 – except in this case your science experiment will end with a delicious cup of coffee in hand. These were popular in the beginning of the last century, before paper filters became widely available. This method uses either a cloth or metal filter instead.There are generally four major components to a syphon brewer: the bottom pot, the top pot, the burner and the stand (which holds the bottom pot). How it works: After filling the bottom pot with hot water (you can use cold water but it’ll take much longer), ignite the burner and slide it under the pot. As it starts to warm up and bubble, secure the filter to the top pot and insert the syphon into the bottom pot. This creates an air-tight seal. As the water continues to heat, the resultant water vapour expands, forcing the water upwards through the siphon and into the top pot. When most of the water is in the top pot (there will always be some water remaining in the bottom pot), add your coffee grounds into the open top pot. Gently press them into the water to immerse them all, then stir again. After about four minutes, remove the heat source. As the bottom pot cools, it creates a vacuum, sucking the liquid through the filter and back down through the syphon. When all is done, the bottom pot will contain delicious, clean and very hot coffee.Easy-peasy. The showmanship of this device is outstanding. It never fails to entertain and delight guests. By having a constant heat source, the coffee-making process remains at an optimal temperature throughout, creating a better tasting coffee that’s crisp, clean and with excellent body. This is an ideal brewing method for highlighting the nuances of single-origin coffees, especially the more delicate ones. 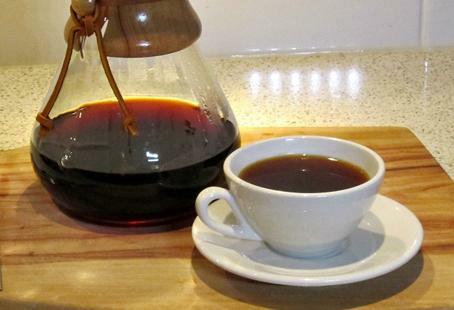 As long as you have access to clean drinking water, you can make coffee in a blackout. It’s a delicate contraption so you’ll need to handle with extreme care. Likewise, use extreme caution around an open flame and when dealing with flammable liquids. This is for the true coffeegeek. It’s not the fastest, hardly the sturdiest and you can’t walk away from while it while it’s brewing, but for someone who loves experimenting and really loves coffee, this is the ultimate brewer.